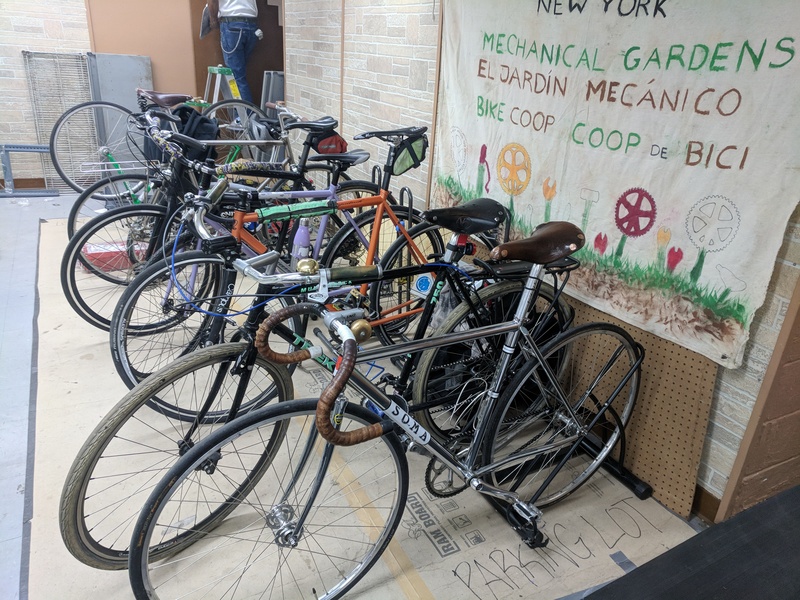 Thank you for making 2017 an incredible year for the New York Mechanical Gardens Bike Co-op! As we enter 2018, Mechanical Gardens (MG) celebrates our first full year of weekly Open Hours programming at our main space in Saint John the Evangelist Lutheran Church. 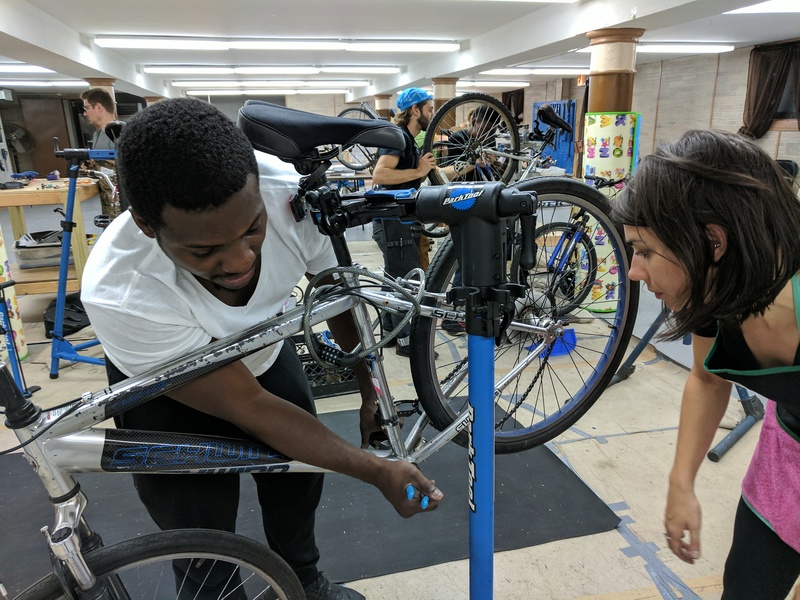 Over the course of the year, our all-volunteer crew has empowered hundreds of New Yorkers to fix their own bicycles through these weekly workshops and at a variety of community events. We have developed relationships with local government, nonprofit, and business partners who share our values. 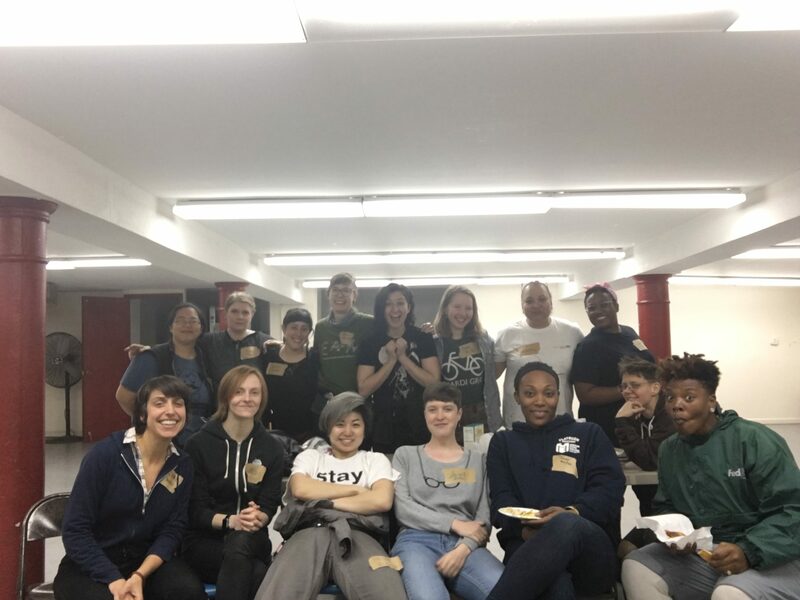 Our members, volunteers, neighbors at St. John’s, and everyone who contributes to MG are hard at work building a welcoming, inspiring, and educational space for all New Yorkers. Outside of Open Hours we celebrated a number of highlights, some of which you can see below in our photo gallery. As we enter 2018, we’re implementing a new set of volunteer squads that will help our growing group of members manage the organization. Squads are forming for: Volunteer Management; Shop Management; Partnerships and Development; Finance; Programming; and Harmony. 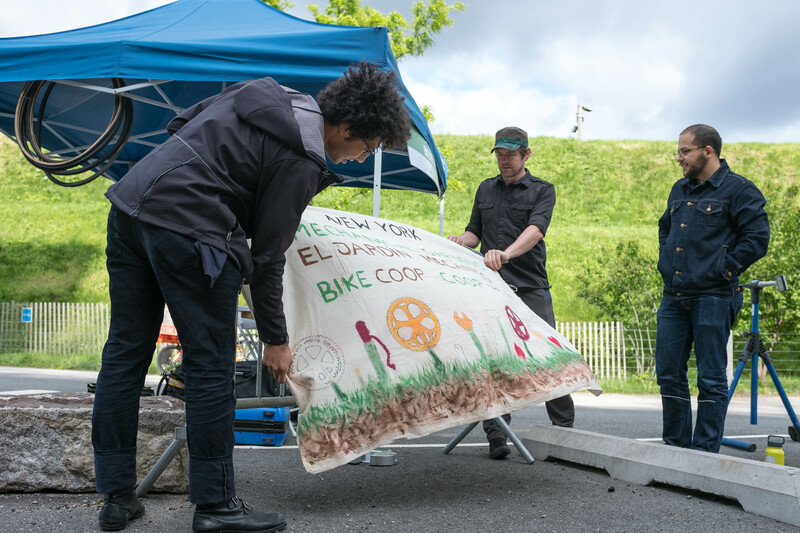 Let us know at bikecoopnyc@gmail.com if you want to squad up! 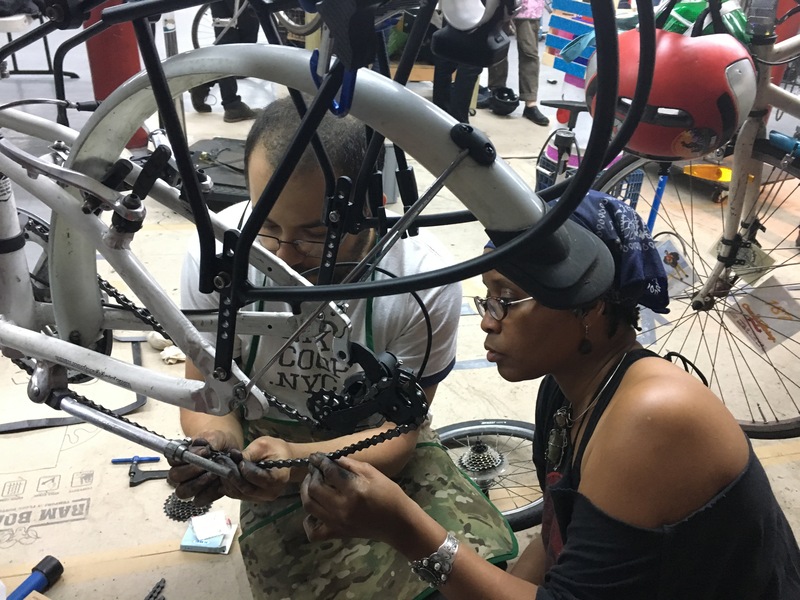 We won a generous grant from People for Bikes to bring a MG bike outpost to southern Queens in collaboration with Smiling Hogshead Ranch. 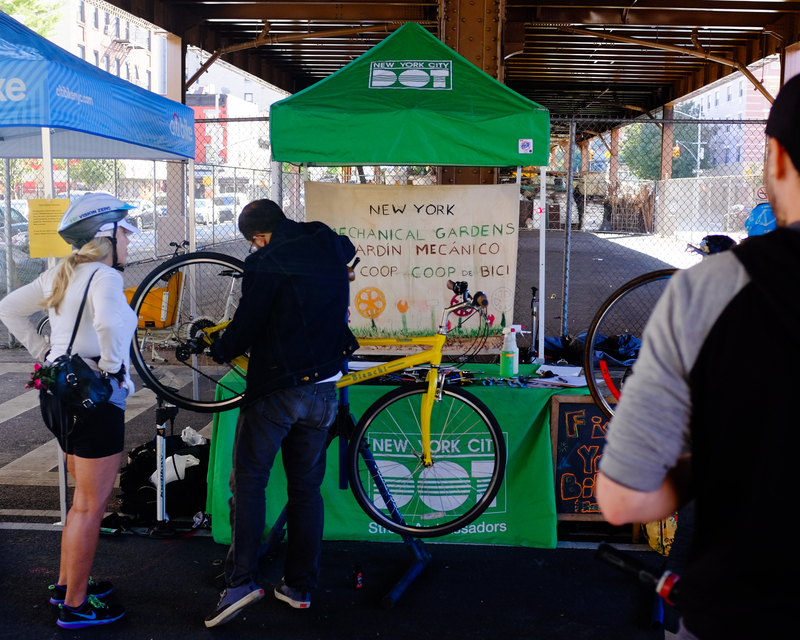 We wrenched at the NYC Department of Transportation’s Biketoberfest event series, and other DOT events throughout the year. 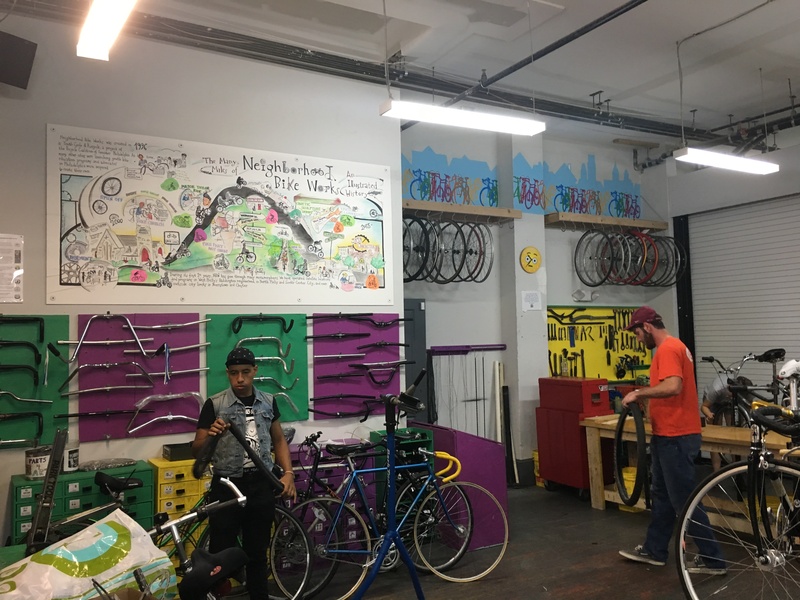 We rode to (or from) Philadelphia to visit a sister community bike shop, Neighborhood Bike Works, to learn from the pros. 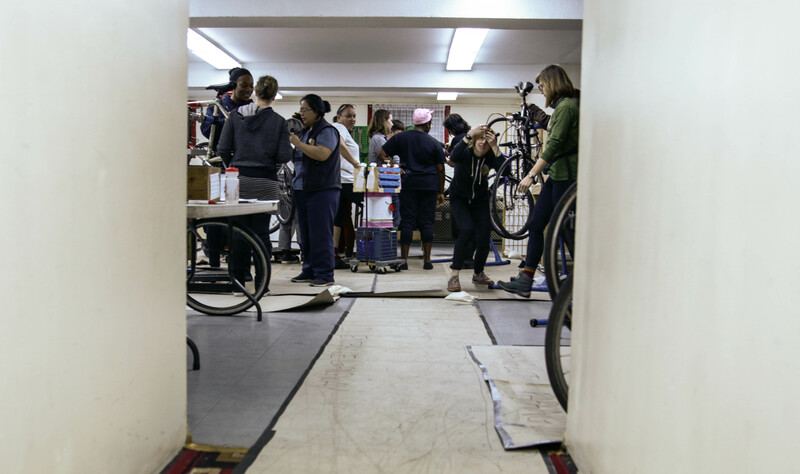 We honored the legendary mechanic Sheldon Brown on a social ride around Brooklyn bike shops. 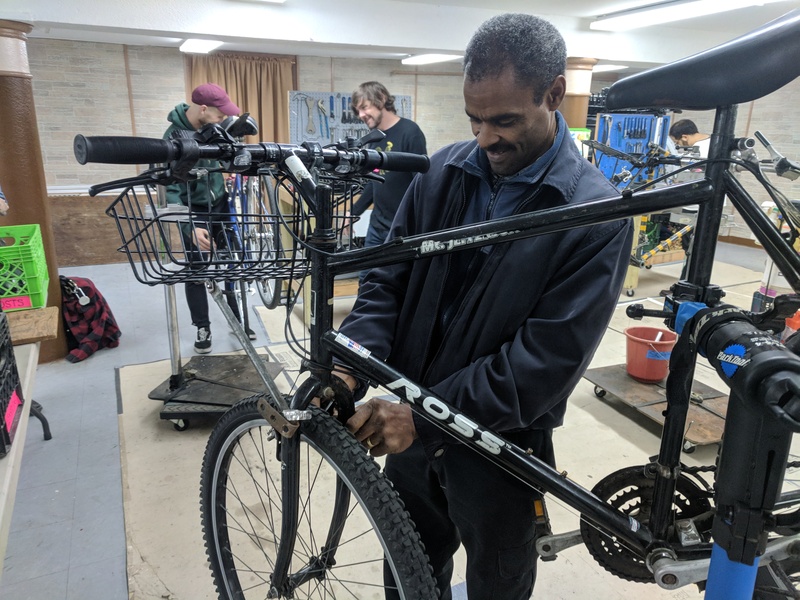 We accepted major donations from multiple bike shop partners like Haven Cycles, Propel Bikes, and 718 Cyclery, and thank Red Lantern Cycles and Nomad Cycles for generously donating a treasure trove of valuable tools, parts, and equipment upon closing. 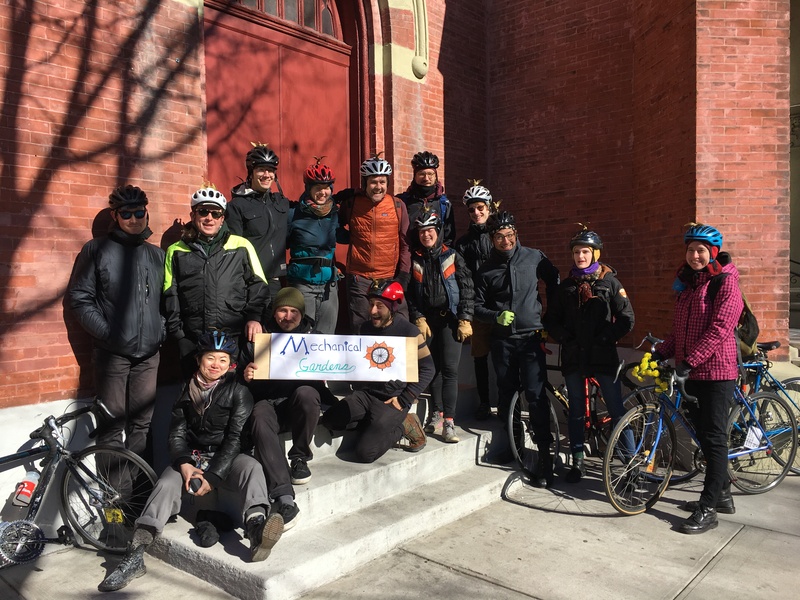 We partnered with two Cranksgiving rides to collect 65 lbs. of baby food, 95 packs of menstrual products, and 25 packs of diapers to donate to the food pantry at St. John’s Church. Maybe we fixed your flat at the Brooklyn Bridge Park rest stop of Bike New York’s Five Borough Bike Tour. 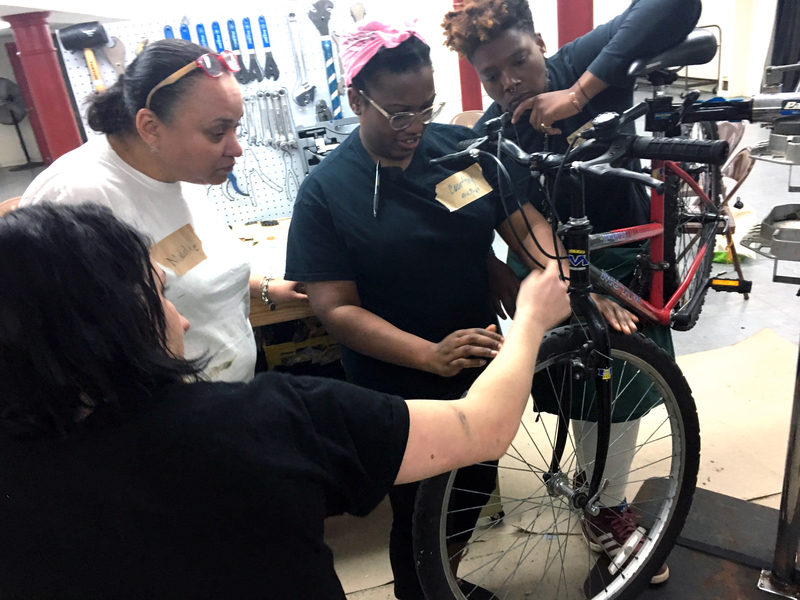 We hosted our first Women Trans Femme intensive repair class series in collaboration with Brown Bike Girl, and got this dazzling write-up in Brooklyn Based! We represented the co-op at Bike!Bike! 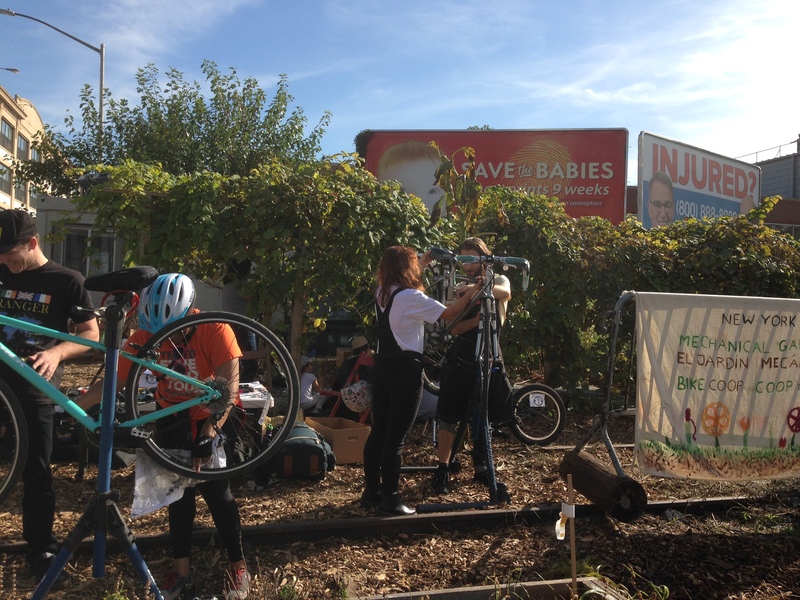 Winnipeg, the international conference for community bike shops. 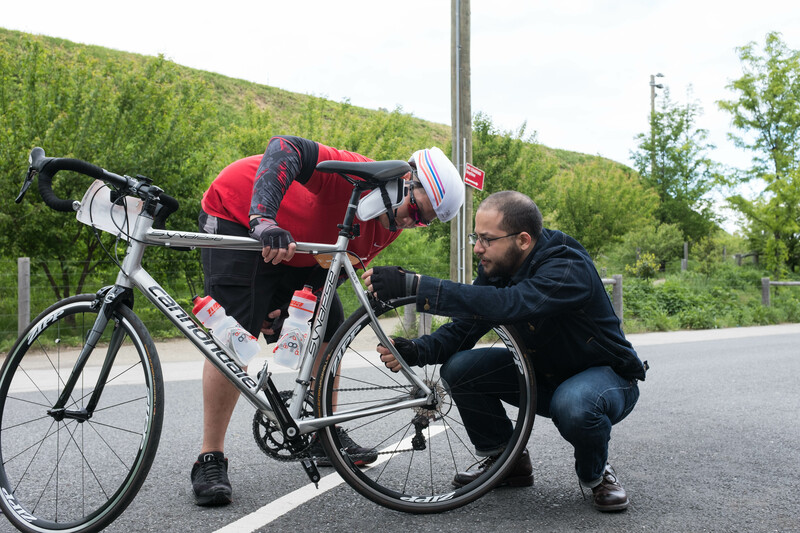 One of the most common things we encounter during our pop-ups: flat fixing/tube changing! 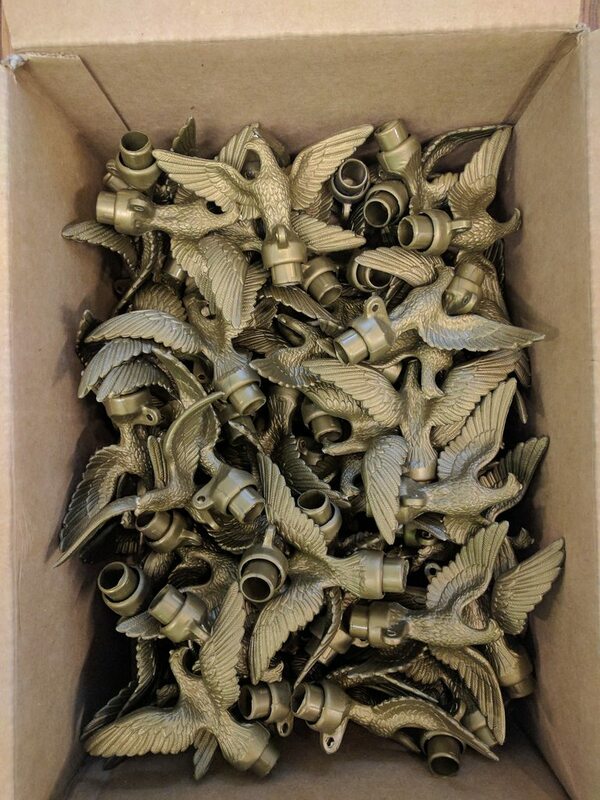 Everyone got eagles for their helmets! Reason: there's a kooky picture of Sheldon with this eagle on his helmet and we loved it. Fun fact: The eagle's name is IGOR. As part of the memorial ride, we rode to our LBS. 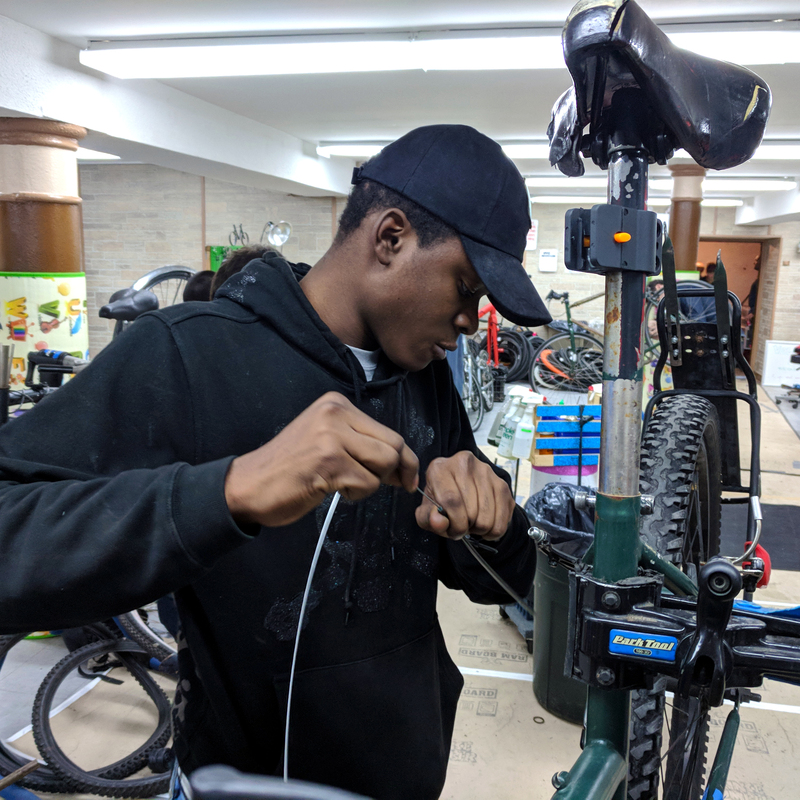 Here we stopped by Bicycle Roots in Crown Heights and this is Pablo pictured here. This should be a familiar sight if you've ever stepped into St John's for Open Hours. Photo by Kate Ryan. Over the course of 3 weeks, we overhauled bikes together. 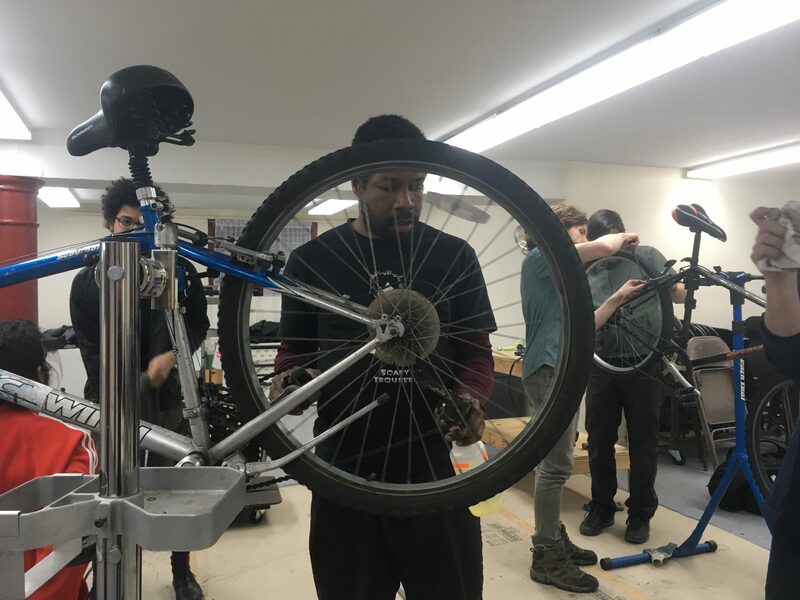 The WTFGNC Bike Maintenance Intensive was open to W/T/F/GNC identifying folkx towards empowering and uplifting less represented individuals in the bike mechanic world. 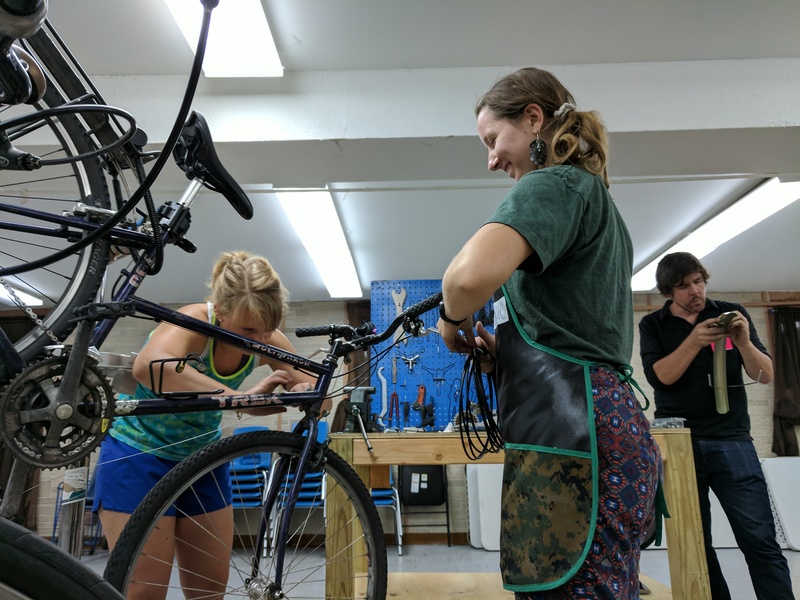 Led by Sera Stravoula, the WTFGNC Bike Maintenance Intensive was open to W/T/F/GNC identifying folkx towards empowering and uplifting less represented individuals in the bike mechanic world. We are out here wrenching!!! Even when we are doing pop-up events, we try to continue to embody the spirit of learning and community empowerment. Here, Michael shares with a rider what he sees and how they can diagnose for themselves in the future. 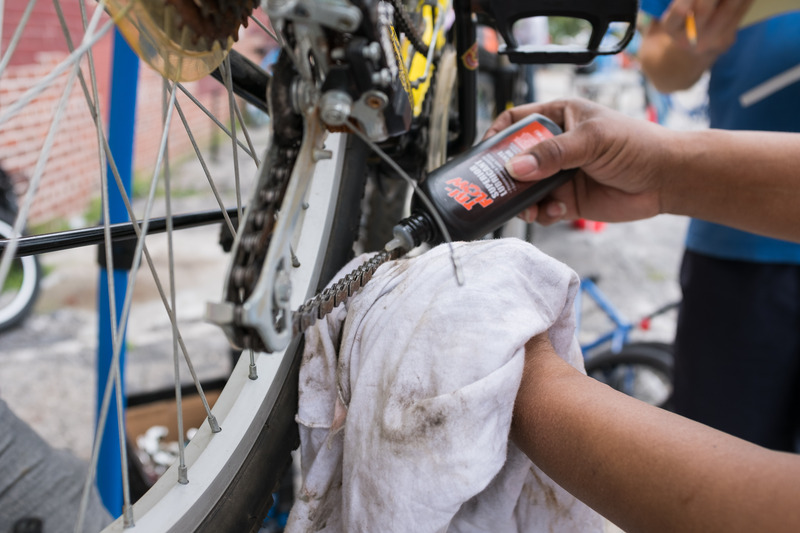 Have you cleaned (and re-lubed) your chain? We encounter all sorts of issues during open hours. The fun part is diagnosing and working on it together. Hands-on = Hands-on! The MGBC mechanic guides you through the steps so for those who like to get greasy... we won't stop ya! During the summer, the youth in the neighborhood like to stop by. It's always great to have their energy in the room and when it's more than 1 at a time, it's been a great exercise for us to think about how to be engaging and share knowledge to a bigger group. 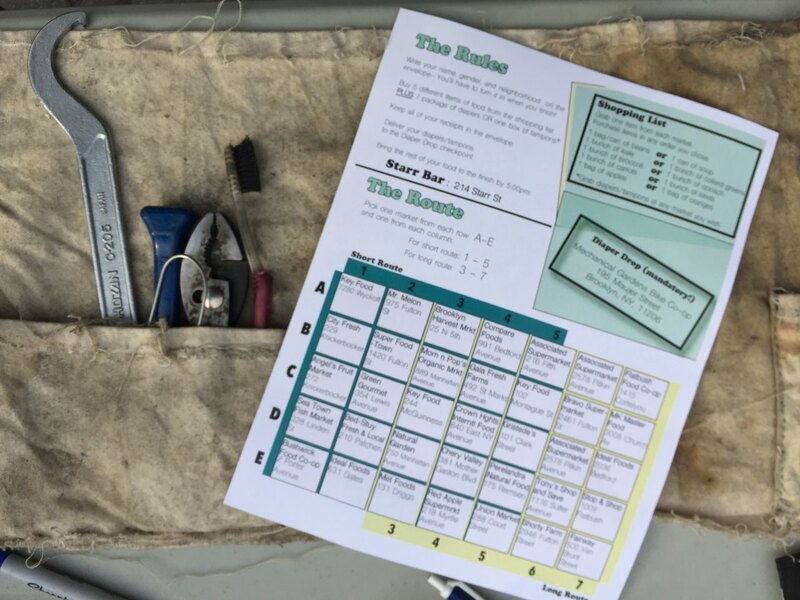 We fix outside! A change of scenery once in a while is nice. 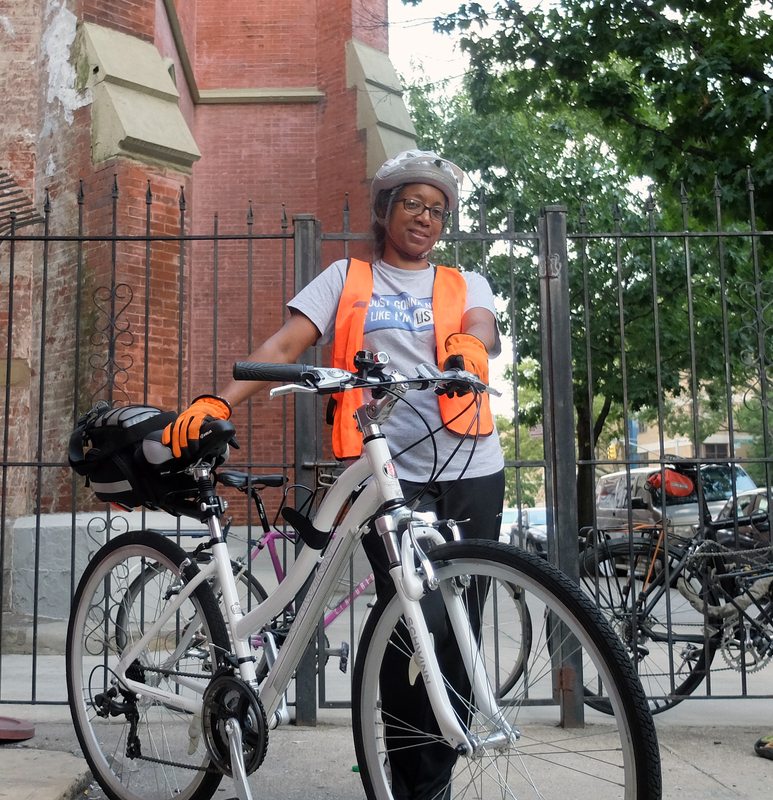 Here's a happy biker (we hope) after coming through our outdoor open hours and about to hop back on a now fixed bike! 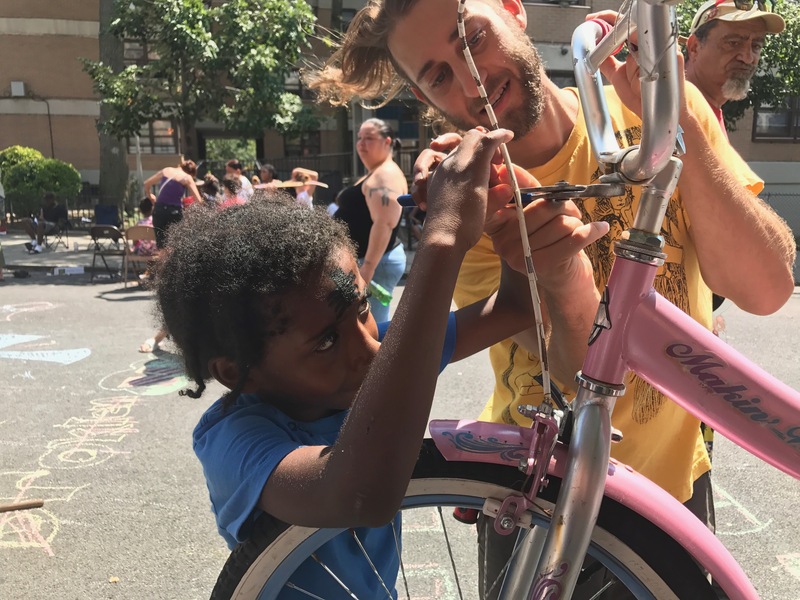 A great crowd and range of bikes from the neighborhood during the Bed-Stuy Bikes event in June 2017. 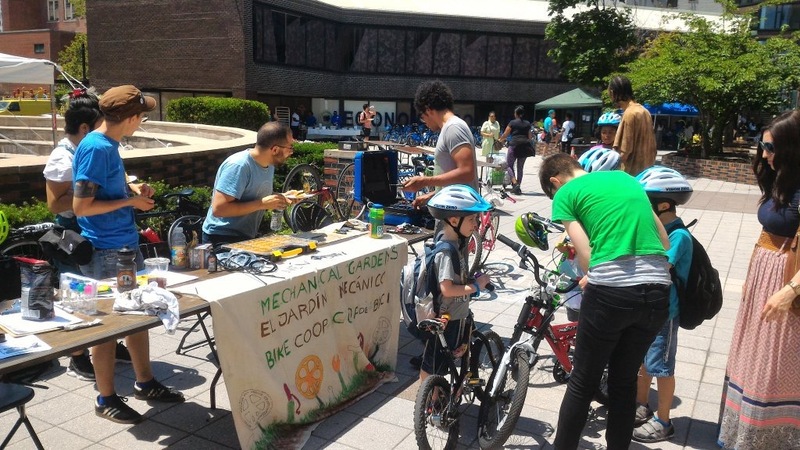 We set up outside St John's during the block party and got to fix the neighborhood's bikes together! Yup. We are a contained operation! 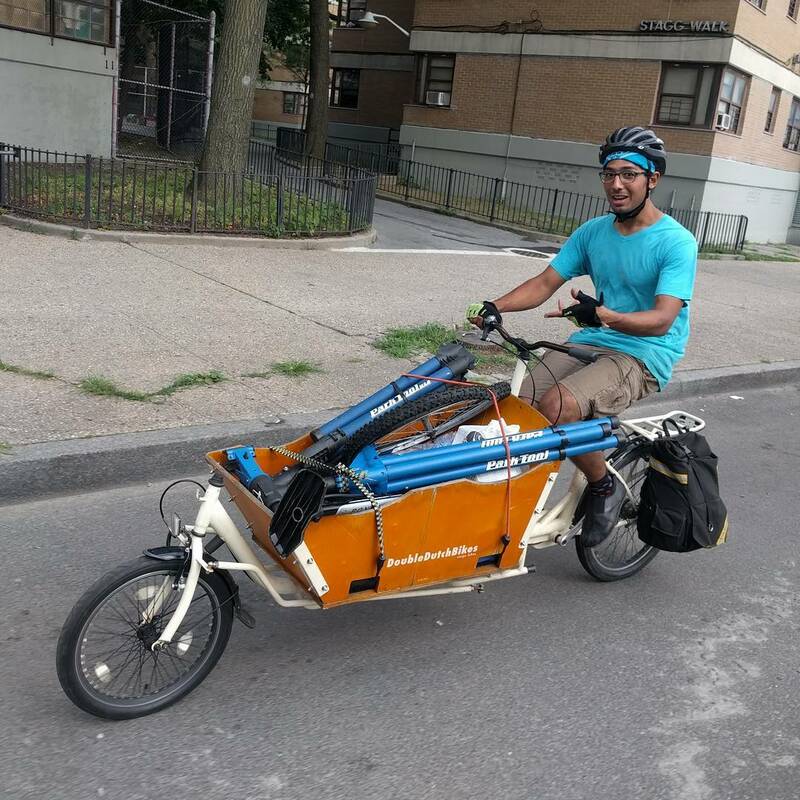 This is Bahij hauling our gear to Canarsie Pier to fix a ridiculous amount of bikes with Recycle a Bicycle, Bike New York and DOT. 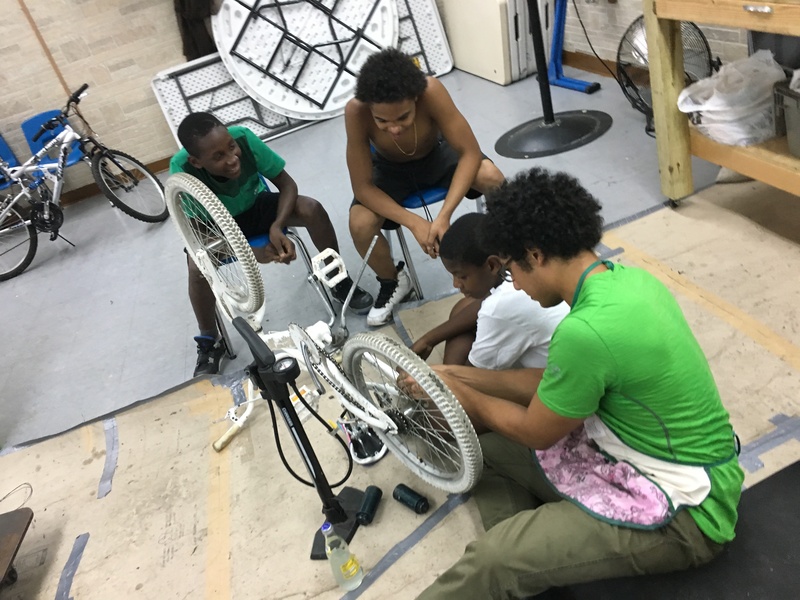 We won a generous grant from People for Bikes to bring a MG bike outpost to southern Queens in collaboration with Smiling Hogshead Ranch. Here is one of our early meetings together with the folks at the Ranch. Riders dropping off their donations. Here's a "midpoint" of Cranksgiving. By the end of the ride, we collected 65 lbs. 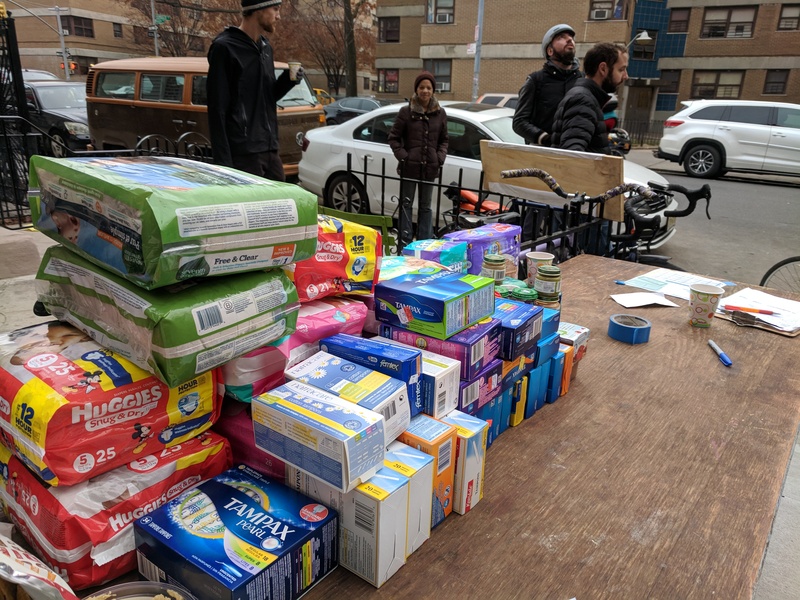 of baby food, 95 packs of menstrual products, and 25 packs of diapers to donate to the food pantry at St. John’s Church. 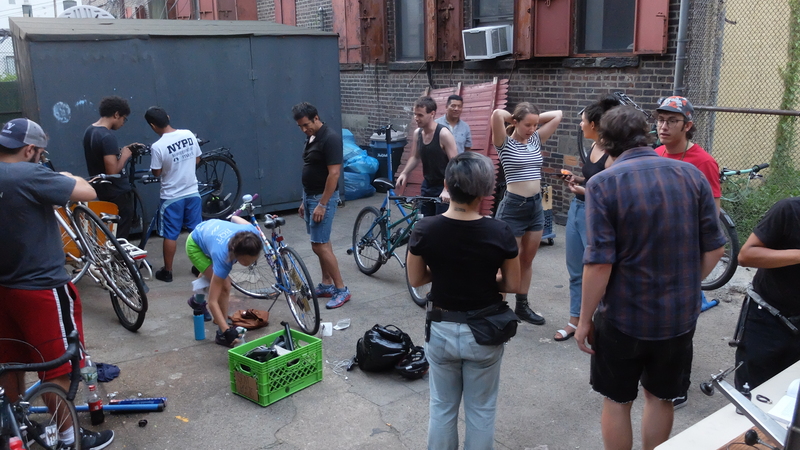 One of our first few field trips as a bike co-op – outside of NYC! Biking around. 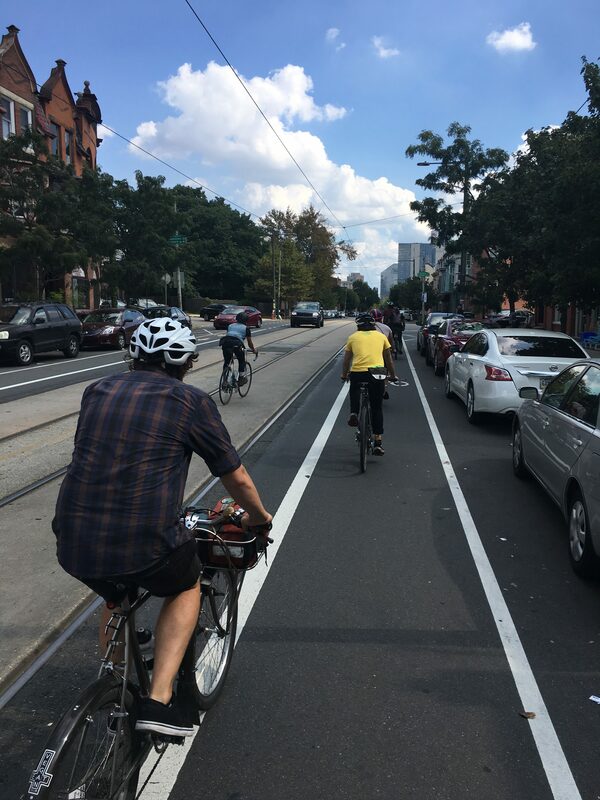 Blue skies, bike lanes, and a great crew. 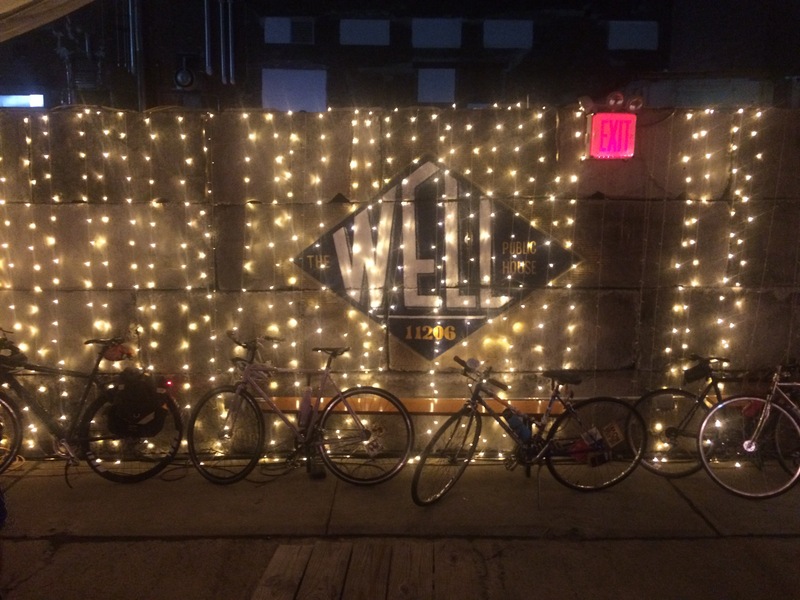 Happy to be part of NYC Department of Transportation’s Biketoberfest event series! Knowing how to cleaning your bike is a simple and very doable skill to acquire. And it goes a long way. Our setup is lean and friendly. 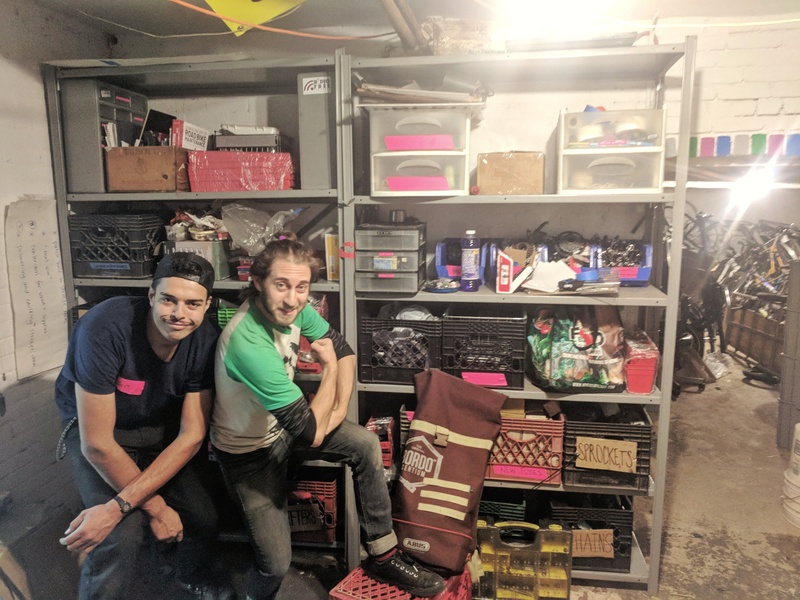 Thanks to our friend Brian at Red Lantern, we got a great haul of donations from the shop AND organizing capacity in the back room. We are sad to see Red Lantern go... but also so grateful to have people like Brian in our midst (and we'll see more of at the shop!). 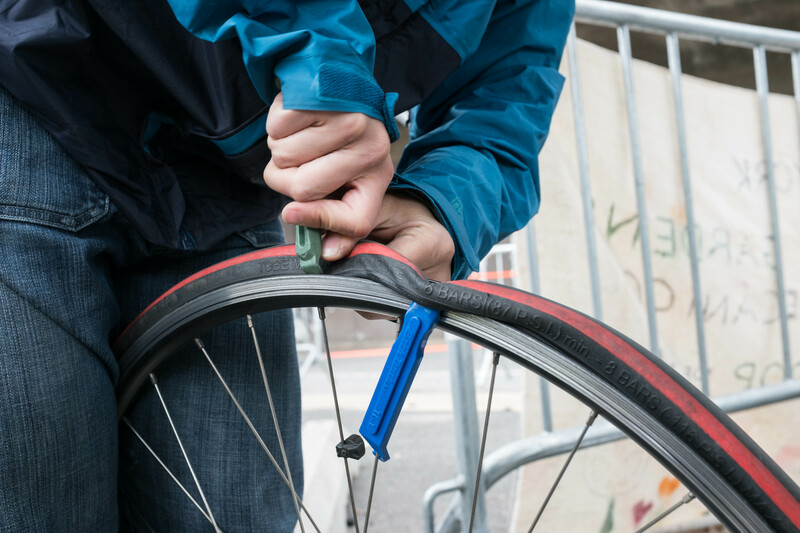 If you already know how to fix your bike, we welcome you to come through to use our stands and borrow our tools! 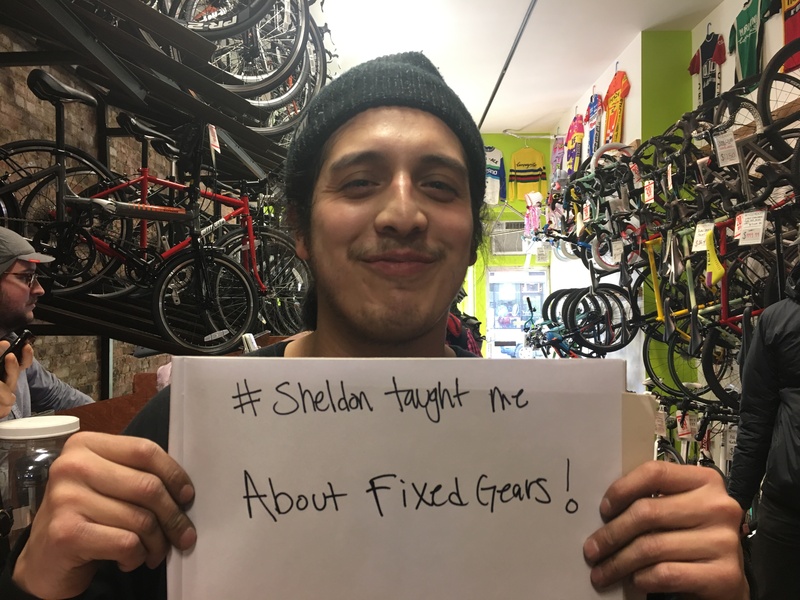 You shouldn't need to purchase a shop to be able to fix your bike. 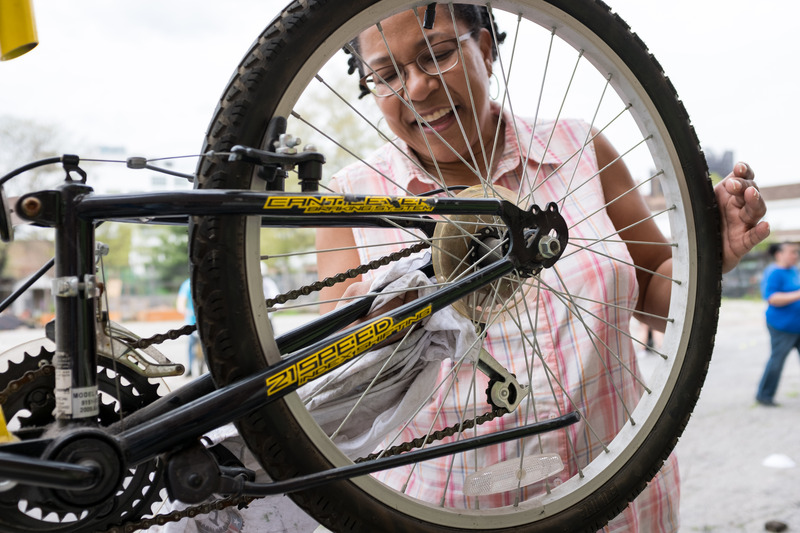 You can come through the co-op and fix your bike... AND you can also be a volunteer or a volunteer-mechanic! Ask any of the co-op members for more information. We have a wheel truing station! 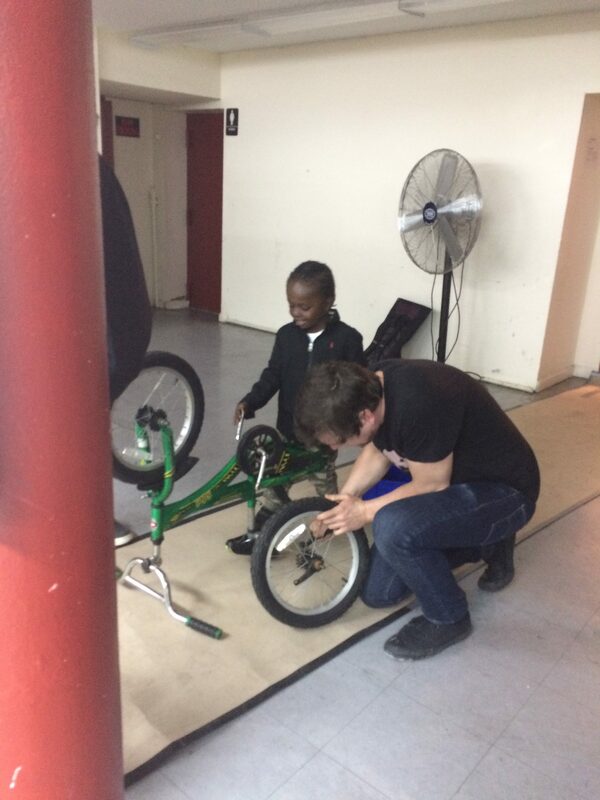 Here's Zach fixing up this bike for small Danny. We don't usually have kids bikes, so that was a fortuitous match. Sometimes, after Open Hours, we hang out at our local watering hole to catch up on our non-bike lives. Wait, who are we kidding?! There is no such thing. Shoutout to Shawn at The Well! 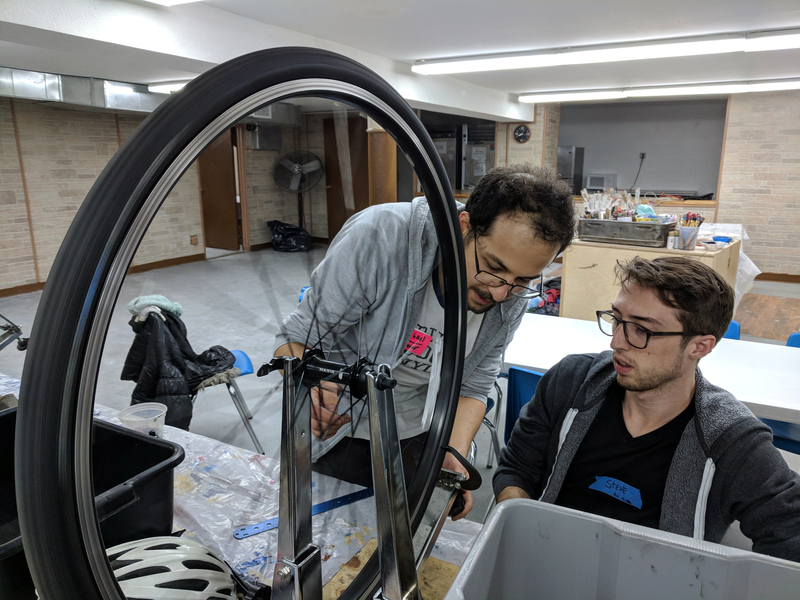 Open Hours is a weekly open workshop time to work on bikes. 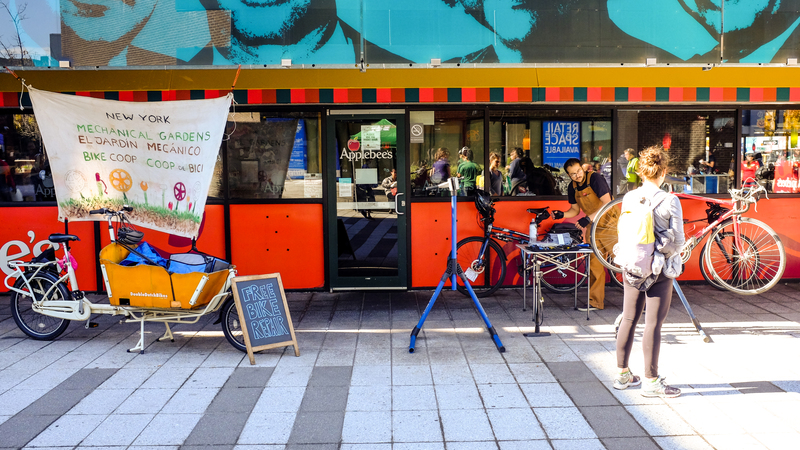 You can fix your own bike, or soup it up. You'll have access work stands, truing stands and the tools you need to complete nearly any bike project. We welcome volunteers! Just drop-in, no bike required. We'll put you to work on tasks that keep the workshop and the co-op rolling. 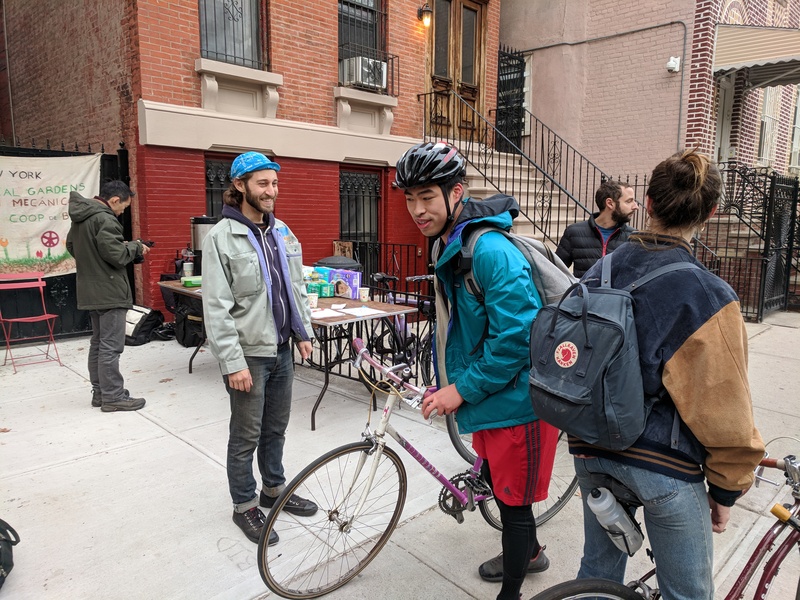 Join Trans Alt volunteers to organize and plan advocacy actions to make North Brooklyn's streets safer for pedestrians and bicyclists and improve public transit. 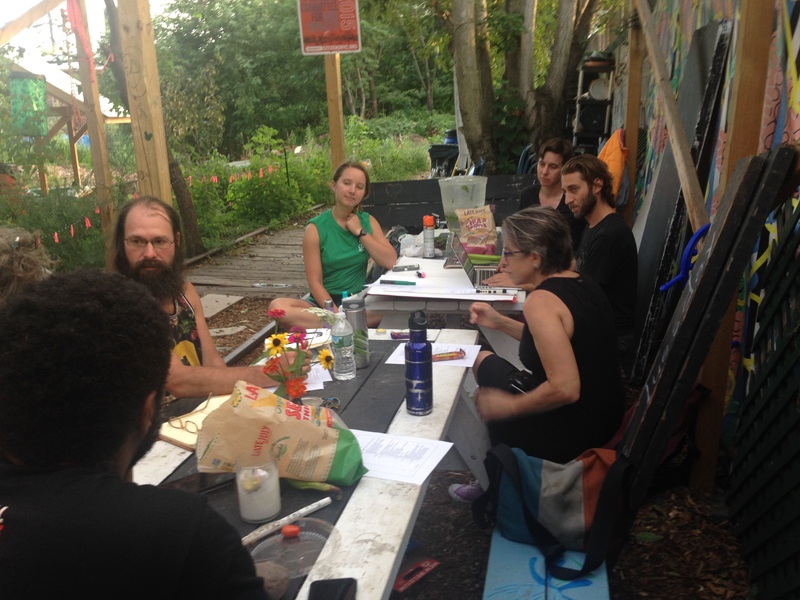 We meet on the 3rd Wednesday of every month at Mechanical Garden Bike Co-op.